I did a bit better reading (and perhaps worse blogging) this year, upping my total to 26 books for the year, or one every other week. My top 5 books of the year are in bold text; interestingly, even though I read a lot more fiction than non-fiction, the majority of my favorites are non-fiction. 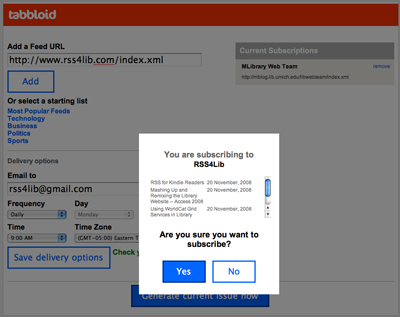 Have you even wanted to subscribe to an RSS feed in Firefox, Safari, Internet Explorer, Bloglines or Google Reader (or anywhere else, for that matter), but discover that the feed is inconveniently served from behind a login-protected server? We all have, I think. Well, now a free web service allows you to do just that. As convenient as it is, this is a spectacularly poor idea. 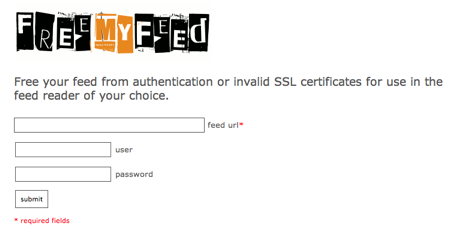 Well, it is encrypted, but there’s usually a good reason that a feed is behind a login. This takes those feeds and puts them out in the public, where any search engine find them, index them, and expose your organization’s secure information. End runs around reasonable security are poor choices. I would recommend that, if your organization has RSS behind a login, that you work with your technical group to block FreeMyFeed from accessing your site. To their credit, there is a fairly explicit disclaimer of the risks on the FreeMyFeed front page, that includes a warning to be careful and not to share your personalized URL with anyone (other than the feed readers, of course). So if you must use this tool, use it only on your own browser, not on an aggregator to minimize the sharing of an all-access URL to your feed. Don’t be tempted. 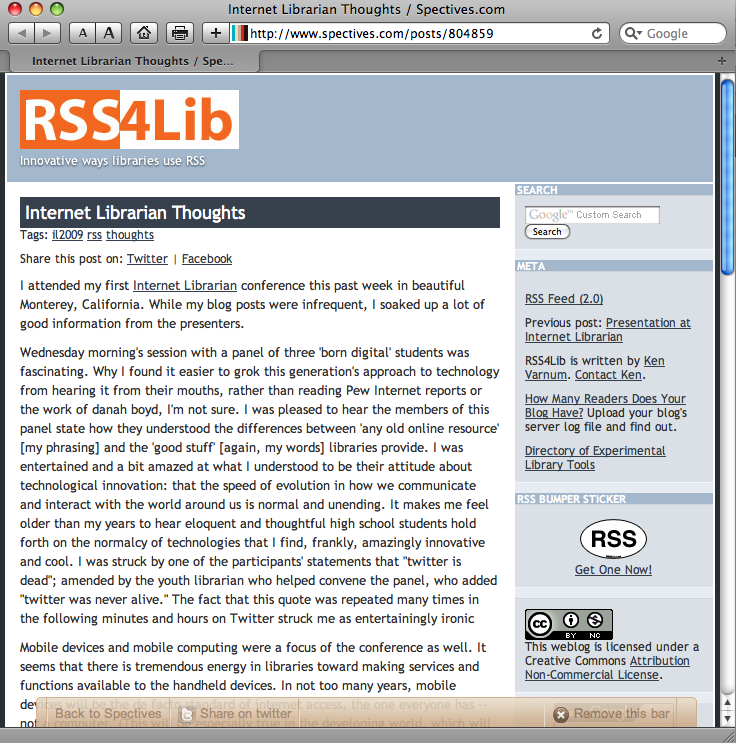 I found a new tool (via a review at ReadWriteWeb) that offers a visual presentation of changing RSS feeds: Spectives, a “search for visual news.” Conceptually, it’s quite interesting. Its use of intellectual property is unfortunate. Interestingly, Spectives ignores posts with embedded video (at least, the UStream feed embedded in a recent post on this blog). Spectives’ front page offers a one-minute tutorial right up front — probably because the point of the tool is a bit vague, if intriguing — and then lists popular and featured collections. The “Nature Photography” collection (under featured) offers pictures from five photography feeds; the “Celebrities” collection pulls in feeds from 15 gossip/tabloid sites. While the tool is interesting, its mechanism for getting users to the source content is highly annoying. Each collection (and search) comes with its own RSS feed that includes all the items in the source’s feed, not restricting it to images. 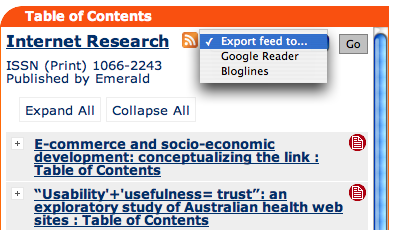 Clicking to the full text of an item in the RSS feed takes you to the original site, which makes sense. However, Spectives puts a translucent toolbar across the bottom of the page with a link “Back to Spectives” and a link to share the post on Twitter — with a Spectives URL built in. Here’s a sample of my previous post, in its entirety, with a Spectives URL and my Creative Commons license, along with the Spectives toolbar. At the moment, this is probably in technical compliance with the Creative Commons license — however, as the “advertise” link on the bottom of every Spectives web page indicates, the site is clearly trying to monetize other peoples’ content. In my opinion, Spectives’ reproduction of my entire web site separated from my URL crosses an ethical, if not legal, line. I am not a fan. The FTC yesterday released an updated version of “16 C.F.R. Part 255: Guides Concerning the Use of Endorsements and Testimonials in Advertising: Notice Announcing Adoption of Revised Guides” — guidelines for acceptable endorsements and reviews of consumer products. The full document is available from the federal register. Thus, a consumer who purchases a product with his or her own money and praises it on a personal blog or on an electronic message board will not be deemed to be providing an endorsement. In contrast, postings by a blogger who is paid to speak about an advertiserâs product will be covered by the Guides, regardless of whether the blogger is paid directly by the marketer itself or by a third party on behalf of the marketer. … For example, a blogger could receive merchandise from a marketer with a request to review it, but with no compensation paid other than the value of the product itself. In this situation, whether or not any positive statement the blogger posts would be deemed an “endorsement” within the meaning of the Guides would depend on, among other things, the value of that product, and on whether the blogger routinely receives such requests. If that blogger frequently receives products from manufacturers because he or she is known to have wide readership within a particular demographic group that is the manufacturers’ target market, the blogger’s statements are likely to be deemed to be “endorsements,” as are postings by participants in network marketing programs. Similarly, consumers who join word of mouth marketing programs that periodically provide them products to review publicly (as opposed to simply giving feedback to the advertiser) will also likely be viewed as giving sponsored messages. My reading of this says that if I frequently reviewed commercial items (books or software, for example) that were given me free of charge for review purposes, I would need to disclose the source of the item I was reviewing. So far, that hasn’t happened, although web developers have occasionally told me about their new (and uniformly free) RSS services. I have (sometimes) chosen to review those tools. No money has ever changed hands and, because the products themselves are free, I received no financial advantage through my reviewing. That the FTC is weighing in on blogs and their role in our consumer society shows what an impact the blogosphere has made. It is important for all of us bloggers to keep in mind that what we write can have a financial impact, whether we are commercially-driven or not (I am in the sense that I really hope you click those ads in the sidebar, but not in the sense I’m looking for money to write what I write, when I write it). And when there are financial incentives, as defined by the FTC, it’s important to state them explicitly. A few minor quibbles… The color palettes are “web safe”, which means you can’t match exactly the color scheme on the site. The web page where you configure your box doesn’t handle wide formats for the box very well — so if you want to preview your RSS feed wider than about 200 pixels, the preview overlaps the form you fill out (at least, for the Mac versions of Safari and Firefox). And the form requires you to enter an RSS feed’s URL, not the URL of the site — there’s no autodiscovery. But in terms of ease of use, this seems as powerful as the hosted version of Feed2JS and as flexible as Google’s similar tool. 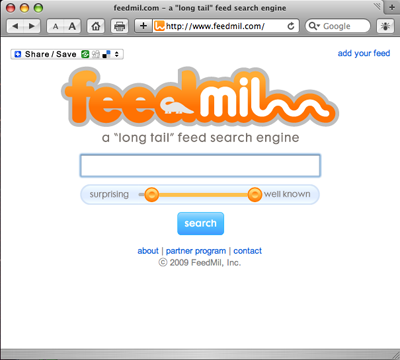 A new feed-finding search engine, Feedmil, has made an appearance. 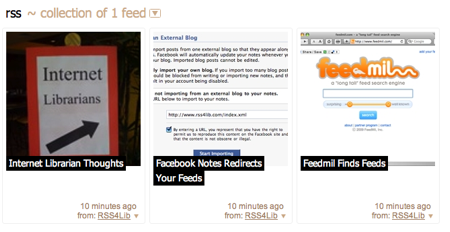 Feedmil is a feed-only search engine with some clever interface features to help you narrow down your search. Feedmil’s Google-inspired front page asks, “what are you into?” and provides a sliding control so that you can adjust the results from “surprising” to “well known” — at either end. Want only well known feeds? Move the left end of the slider to the right. As soon as you let go of the slider, your search starts — keeping you from adjusting both ends. I found it a bit surprising that the search started as soon as I moved a slider. 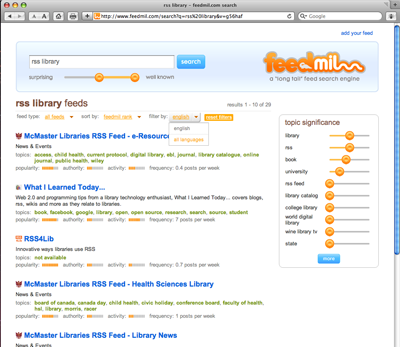 There are several filtering options running across the top: Feed type (starts at ‘all feeds’, but also lets you narrow searches down to blog feeds, microblog feeds, podcasts, public media feeds, and social media feeds); sort options (Feedmil rank, quality, and relevance), and language. On the right, there’s a “topic significance” section that lets you select how much weight each of the topics (as determined by Feedmil) should have. Playing with these sliders reorders the search results; as with the front page, as soon as you let go of a slider, the display changes. If you want to restrict results to only one extreme or the other, simply move the slider all the way over. I need to spend some more time using this tool, but I’m favorably impressed with my first look (aside from the odd interface issues noted above). Via What I Learned Today. 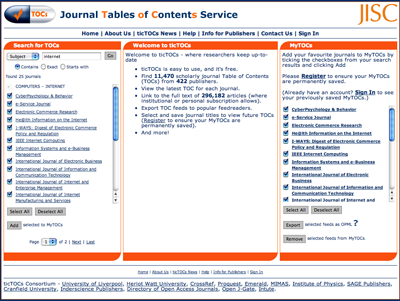 The idea behind ticTOCs is to make finding and subscribing to table of contents RSS feeds a simple process. This free service is long overdue. Getting lists of tables of contents from journal publishers is time-consuming, if it is possible at all. Being able to pull together feeds across journals in one OPML file will prove helpful to libraries wanting to deliver current awareness services, have more up-to-date subject guides (with a list of recent articles in that topics ‘hot’ journals), or to augment catalog records. 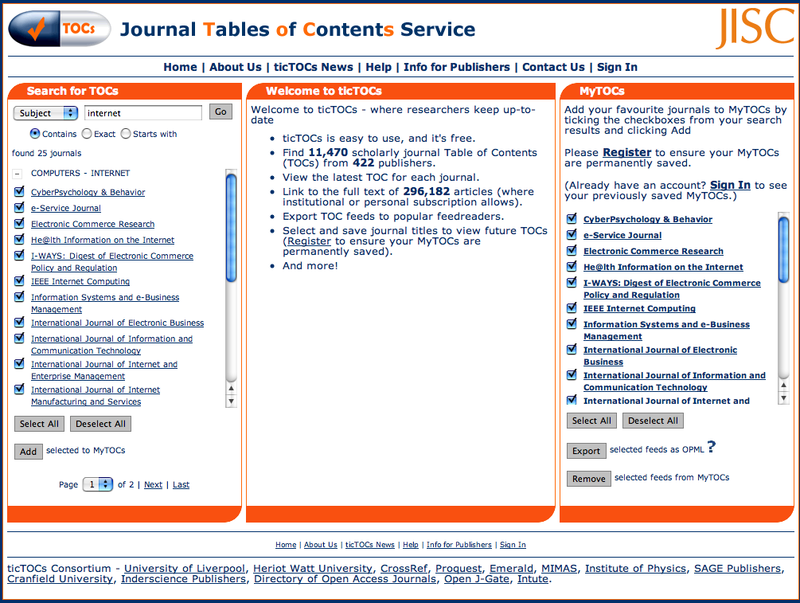 The site lets you identify journals of interest by topic, by title, or by publisher, subscribe to their tables of contents (the “TOCs”) by checking (“ticking”) a box, and then getting an aggregated feed of articles and abstracts to review. You can add all journals matching a search (subject, title word, or publisher) to your profile with a single click, or add individual titles. You can export the subscription list of tables of contents as an OPML file to add to your favorite reader. For example, here is an OPML file of the 25 journals in the Computers — Internet category. 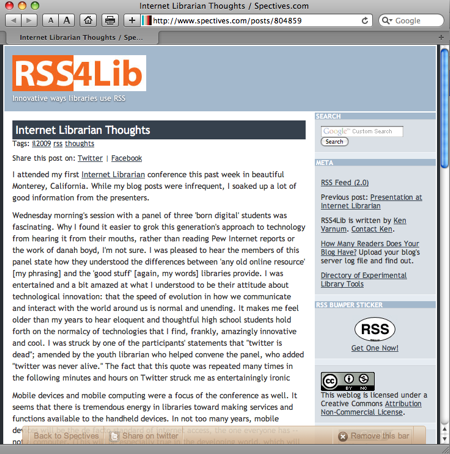 TicTOCs display each journal with its title, the standard icon for the RSS feed, and a menu to add that feed to either Bloglines or Google Reader. Articles are shown by title; a link at the top of the display allows you to show the full abstract provided by the publisher. 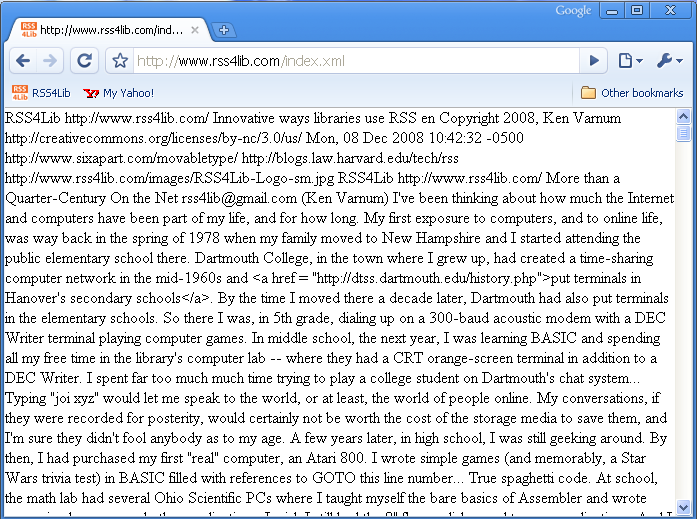 And each article includes a link to add the citation to RefWorks. TicTOCs also opens the door to other advanced services. For one example, once you have an OPML file for the RSS feeds for a group of journals, that list of feeds could be run through Yahoo! Pipes or other similar tool to filter for keywords. For another, the OPML file from ticTOCs could be edited to redirect all full-text links through the library’s proxy server, allowing that library’s users to get to the full text articles without any hassle at all. Future developments I, for one, would like to see include (of course) more publishers — where’s Elsevier — and a simple way to query ticTOCs with a journal’s ISSN or EISSN and get back the canonical RSS feed. Such a service would let libraries more easily add an RSS feed for a journal to that journal’s entry in the local library catalog. It would also be helpful, at an institutional level, to have automatic rewriting of full-text URLs in table of contents feeds that included the library’s proxy server. This service will save librarians time and, more importantly, save patrons time. There are, in fact, 1870 Elsevier journal titles in ticTOCs — thanks to Roddy MacLeod for pointing out my error. For you programmers out there, ticTOCs now offers a downloadable file of journal titles, ISSNs, and RSS feed URLs. Not quite an API, but a good start. See the ticTOCs news site for details and or get the ticTOCs data set for yourself. Google released its Chrome web browser back in September as a beta. Unlike so many other Google tools that are in perpetual beta, Chrome today is now a full-fledged product (see Google’s press release to this effect). Given that Google has a perfectly serviceable RSS reader, and seeing the importance Google has clearly placed on Chrome — moving it from public beta to supported software in an unheard of three months — it seems even odder now than in the beta stage that Google has chosen not to make use of it. Tabbloid is a utility provided by HP that takes one or more RSS feeds and converts them to a PDF document. The PDFs can either be emailed to you on a schedule you set — hourly, daily, or weekly — on the hour (for daily mails) or day (for weekly) you specify. The PDF files Tabbloid sends out appear to be incremental — so you only receive news published in the subscribed feeds since the last mailing. Add a feed (you can add as many as you like), enter an email address, pick your delivery options, and save them. The resulting PDF file can either be downloaded instantly or sent by email. A few notes about the PDF. The document is nicely formatted in two columns and is easy to read. Each item is identified by title and blog source, though the post’s author is not displayed. The title links to the original version of the item on the web. The favicon for the blog is displayed after the article. A few criticisms of the PDF: First, in my tests, the order of articles is apparently random. This does not seem appropriate when the layout of the items is in a simple two-column format. Second, the time stamp displayed on each article is the same — and is the time stamp for the most recently published article. A few minor bugs mar Tabbloid’s performance — especially for a tool not blatantly labeled “beta” — but it makes a handy tool for offline reading. The service has its own weblog, but all that’s listed is a brief introductory statement promising more things to come. One suggestion in the blog’s comments is to add an OPML import tool — an excellent suggestion. 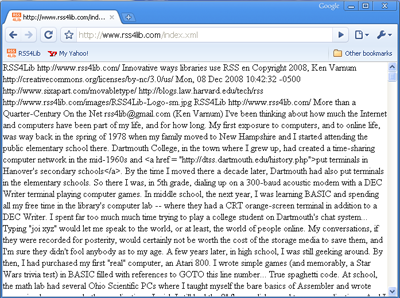 Overall though, this RSS-to-PDF tool has a simple user interface and a clear, easy-to-read output format.